Acute Respiratory Distress Syndrome (ARDS) patients require mechanical ventilation (MV) for breathing support. Patient-specific PEEP is encouraged for treating different patients but there is no well established method in optimal PEEP selection. A study of 10 patients diagnosed with ALI/ARDS whom underwent recruitment manoeuvre is carried out. Airway pressure and flow data are used to identify patient-specific constant lung elastance (E lung ) and time-variant dynamic lung elastance (E drs ) at each PEEP level (increments of 5cmH 2 O), for a single compartment linear lung model using integral-based methods. Optimal PEEP is estimated using E lung versus PEEP, E drs -Pressure curve and E drs Area at minimum elastance (maximum compliance) and the inflection of the curves (diminishing return). Results are compared to clinically selected PEEP values. The trials and use of the data were approved by the New Zealand South Island Regional Ethics Committee. Median absolute percentage fitting error to the data when estimating time-variant E drs is 0.9% (IQR = 0.5-2.4) and 5.6% [IQR: 1.8-11.3] when estimating constant E lung . Both E lung and E drs decrease with PEEP to a minimum, before rising, and indicating potential over-inflation. 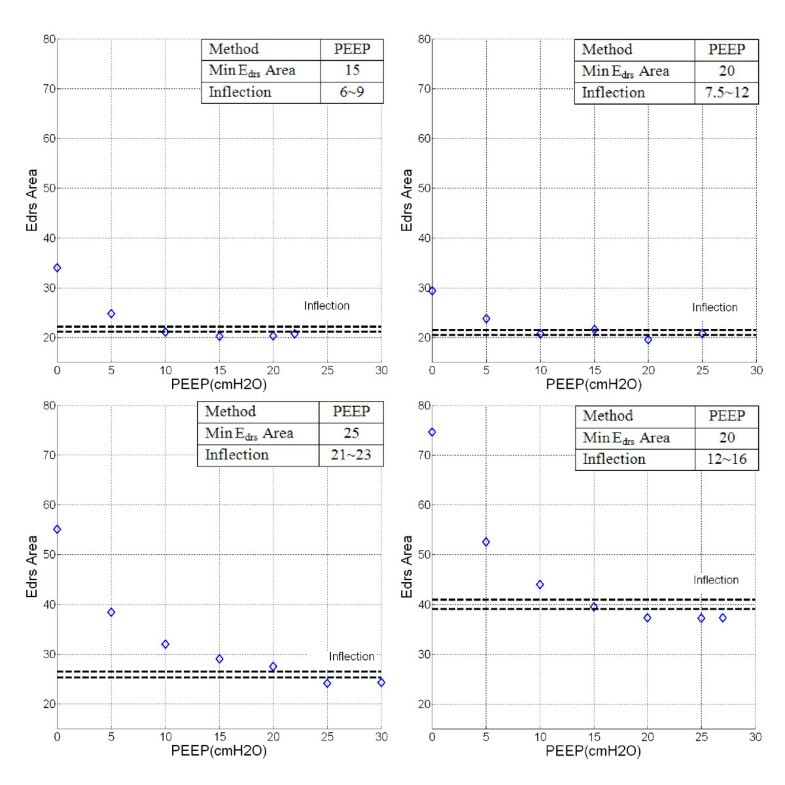 Median E drs over all patients across all PEEP values was 32.2 cmH 2 O/l [IQR: 26.1-46.6], reflecting the heterogeneity of ALI/ARDS patients, and their response to PEEP, that complicates standard approaches to PEEP selection. All E drs -Pressure curves have a clear inflection point before minimum E drs , making PEEP selection straightforward. Model-based selected PEEP using the proposed metrics were higher than clinically selected values in 7/10 cases. 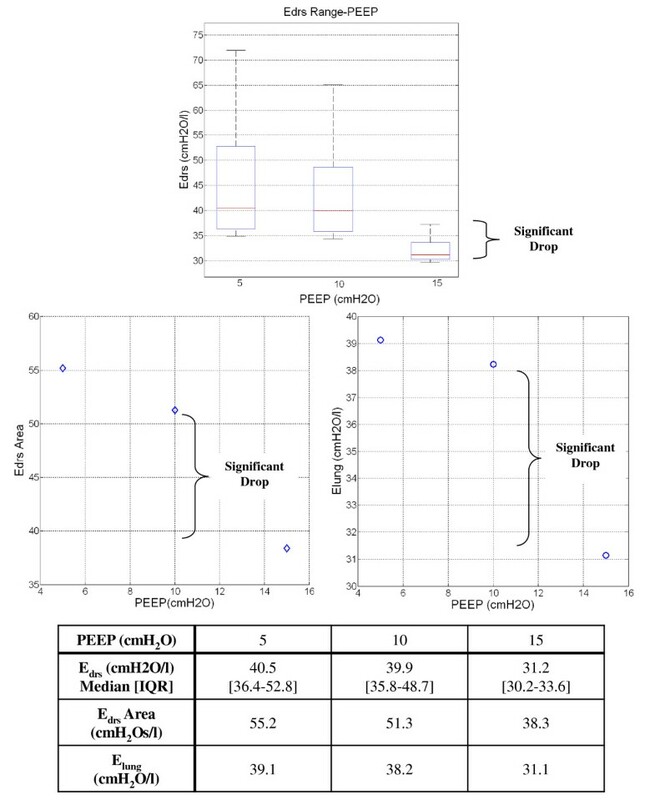 Continuous monitoring of the patient-specific E lung and E drs and minimally invasive PEEP titration provide a unique, patient-specific and physiologically relevant metric to optimize PEEP selection with minimal disruption of MV therapy. Acute respiratory distress syndrome (ARDS) and acute lung injury (ALI), occurs due to severe inflammatory response of the lung, resulting in direct alveolar injury, pulmonary oedema and alveolar collapse [1, 2]. The lung injury greatly impairs the patients breathing, reducing alveolar gas exchange, resulting in possible mortality and morbidity if not given a proper treatment. ALI/ARDS patients are associated with high morbidity, mortality up to 60%  and significant medical cost . Patients diagnosed with ALI/ARDS are mechanically ventilated for breathing support [5, 6]. Various mechanical ventilation (MV) modes have been introduced to clinicians for the support of patients with ALI/ARDS . However, the fundamentals of MV remains in selecting an optimal positive end-expiratory pressure (PEEP) to maximise patients' lung recruitment, prevent alveoli collapse, and avoid ventilator induced lung injury (VILI) . The heterogeneity of the disease and patients' variable response to MV, encourages PEEP treatment to be patient-specific and individualised. However, there is no gold standard method in PEEP selection; consequently, optimising patient-specific PEEP in MV remains a challenge for clinicians [9–11]. Model-based and patient-specific approaches offer the ability to identify intra- and inter-patients variability and thus, potential to guide MV therapy based on patient's condition and needs [12, 13]. This approach provides the opportunity to balance risk of lung injury and lung function support and reduce work of breathing  during MV. However, to date, only a few have been tested [15–17] and their potential in critical care is not yet validated. This research presents several model-based approaches to identify patient-specific disease state and patient-specific response to MV therapy using patient-specific, constant lung elastance (E lung ) [16, 18] with comparison of dynamic lung elastance (E drs ) in ALI/ARDS. Dynamic lung elastance (E drs ) is a time-variant lung elastance during each breath in MV. E lung and E drs are thus proposed for guiding PEEP selection. By monitoring both the identified parameters (Elastance = 1/Compliance) through limited PEEP titration, it is possible to identify PEEP settings that maximize recruitment, minimize work of breathing without inducing lung injury. Ten patients in the Intensive Care Unit (ICU), Christchurch Hospital, New Zealand, diagnosed with ALI or ARDS (PaO 2 /FiO 2 (PF ratio) between 150-300 mmHg), underwent a modified protocol-based recruitment manoeuvre (RM) . PEEP is increased with increments of 5cmH 2 O from zero PEEP (ZEEP) until peak airway pressure reaches a limit of 45cmH 2 O . Patients were sedated and paralyzed with muscle relaxants to prevent spontaneous breathing efforts. All patients were ventilated using Puritan Bennett PB840 ventilators (Covidien, Boulder, CO, USA) with volume control (tidal volume, V t = 400~600ml), synchronized intermittent mandatory ventilation (SIMV) mode, throughout the trial. The clinical trials and the use of the data were approved by the New Zealand, South Island Regional Ethics Committee. A heated-pneumotachometer with Hamilton Medical flow sensor (Hamilton Medical, Switzerland) connected to the ventilator circuit Y-piece is used to record patient's airway pressure and flow data. A Dell™ (Dell, Austin, TX, USA) laptop was used in conjunction with National Instruments USB6009 and Labview Signal Express (National Instruments, Austin, TX, USA) to obtain measurements at a sampling rate of 100 Hz. Analysis was performed using MATLAB (The Mathworks, Natick, Massachusetts, USA). To ensure that the identified parameters of constant E lung and time-variant E drs (E drs (t)) are valid, the absolute percentage error between the identified model and measured clinical pressure data is reported. During each breathing cycle, as PEEP rises, lung elastance (E lung ) falls as new lung volume is recruited faster than the pressure build-ups in the lung. If little or no recruitment occurs, E lung rises with PEEP indicating that pressure above that PEEP level was unable to recruit significant new lung volume and is, instead, beginning to stretch already recruited lung . Hence, recruitment and potential lung injury can be balanced by selecting PEEP at minimum E lung . Compared to a single, constant E lung value at each PEEP, identifying time-variant E drs allows this change to be seen dynamically within each breath as pressure increases thus allowing a more detail view of patient's lung physiological condition. 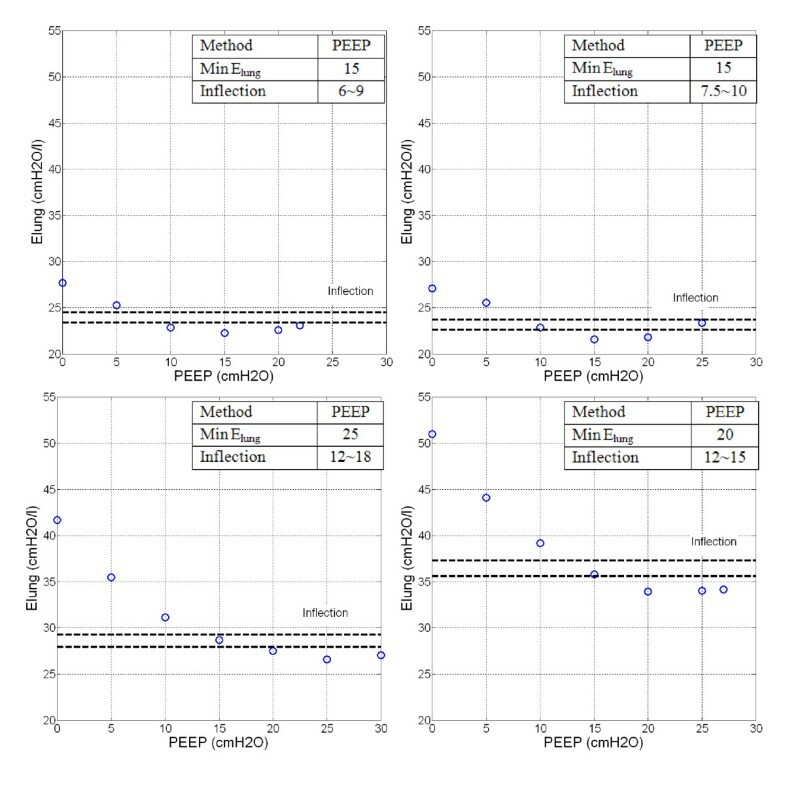 Three model-based approaches based on patient-specific E lung and E drs trajectory in a patient's breath at different PEEP levels are used to optimize PEEP selection. Minimum E drs and E lung : locates the point where minimum E drs or E lung occurs over all PEEP values (and pressure for E drs ) during the recruitment manoeuvre. Minimum E drs Area: E drs Area is obtained by integrating E drs over time during the patient's breathing cycle at each PEEP. E drs Area is more clinically relevant than median or mean E drs throughout each breath and can be shown to be proportional to patient-specific work of breathing. Inflection Method: This method detects the inflection in the E drs Area-PEEP and E lung -PEEP curves. Inflection is defined here at the PEEP value with E drs value 5-10% above (before) minimum E drs Area or E lung (105~110% of minimum E drs Area or E lung ). PEEP is selected where inflection occurs, as a point of diminishing returns. The overall approach implies that as long as E drs falls during each breath, as PEEP level increases, that recruitment of new volume outweighs lung stretching as flow and volume follow a path of lesser or least resistance. These methods are thus attempts to maximize recruitment (Minimum E drs and Minimum E drs Area) and also ensure safety from excessive pressure (Inflection Method). These metrics are three of many possibilities to demonstrate the concept. These approaches were also compared with selecting PEEP using the identified minimum or inflection of constant E lung , for comparison to other similar work . Patient-specific E lung and E drs are only analyzed during inspiration and not during the expiratory cycle. This choice was made because increases in pressure induce lung damage as it passes a limit and thus expiration (decreasing pressure) should not be used to guide PEEP selection. Substituting P aw from Equation (3) into Equation (5) and using P 0 = 0, (atmospheric). E drs Area in Equation (8) is the integral of Equation (7), yielding the relation of E drs to the work of breathing required to overcome lung elastance at a given level of PEEP and mode of MV. 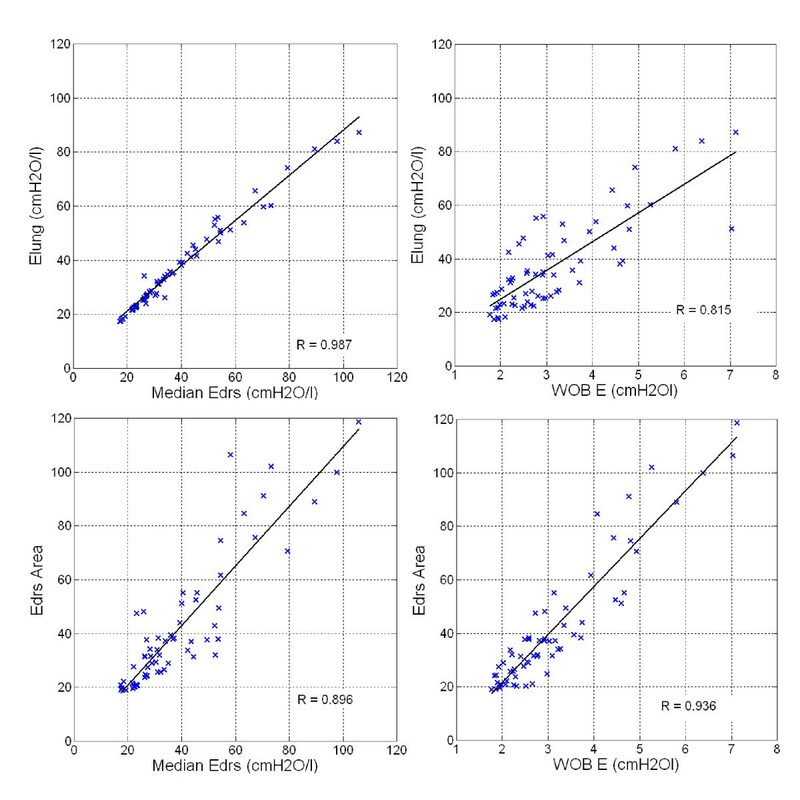 In this study, E lung and median E drs are compared using Pearson's linear correlation coefficients to relate these metrics. E lung and E drs Area are also compared to median E drs and WOB E to ensure there was no loss of information for each patient at different PEEP values, and to show the validity of Equation (7) and using E drs Area. Finally, clinically selected PEEP is compared to the value determined by proposed model-based metrics. Table 1 shows the clinical details of the 10 patients recruited with their clinical diagnostics, and PF ratios. Table 2 shows the median [Inter-quartile Range (IQR)] E drs for each patient and PEEP, and absolute percentage fitting error. Median absolute percentage fitting error (APEEdrs(t)) across all patients and PEEP is 0.9% [IQR: 0.5-2.4]. 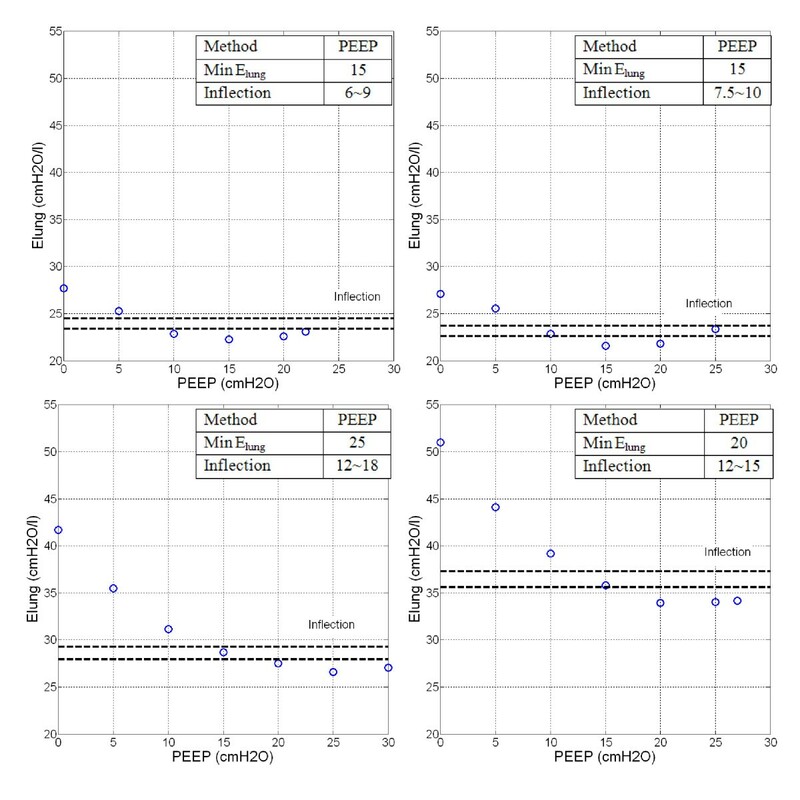 Median E drs at each PEEP is 32.2cmH 2 O/l [IQR: 26.1-46.6]. Median [IQR] E drs decreases with increasing PEEP until the minimum E drs . Patients who suffer from COPD (Patients 1, 4, 5, 9 and 10) have significantly higher E drs than others (P < 0.0001), as expected clinically. Table 3 shows the constant lung elastance (E lung ) at each PEEP with median = 32.2cmH 2 O/l [IQR: 25.0-45.9], and absolute percentage fitting (APEElung) at 5.6% [IQR: 1.8-11.3]. Table 4 shows the E drs Area at each PEEP with median [IQR] of 34.0cmH 2 Os/l [IQR: 24.7-48.5]. Patient-specific dynamic lung elastance (E drs ) at each PEEP level. *Values presented include value from different PEEP. Patient-specific constant lung elastance (E lung ) at different PEEP. Patient-specific E drs Area at different PEEP. Figure 1 shows patient-specific time-varying E drs at each PEEP level for Patients 2, 6, 8 and 10. E drs decreases as pressure increases at each PEEP. However, at higher PEEP, this trend can reverse indicating stretching exceeding recruitment of new lung volume. The optimal PEEP derived by minimum E drs is indicated. 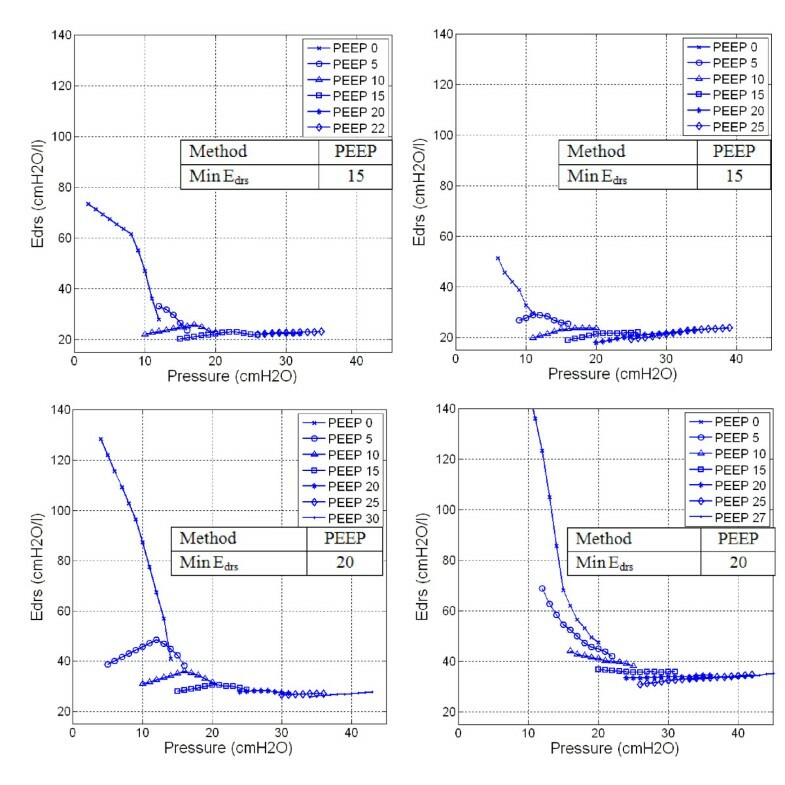 Dynamic lung elastance ( E drs )-Pressure-PEEP plot. Top Left Panel: Patient 2, Top Right Panel: Patient 6. Both patients show significant E drs drop from lower zero PEEP to PEEP 15cmH 2 O. Further increase of PEEP to 20cmH 2 O shows increase of overall E drs . Bottom Left Panel: Patient 8, Bottom Right Panel: Patient 10. Both patients show a consistent drop in overall E drs with increasing of PEEP and overall E drs did not rise with PEEP for the entire ranged considered. Figure 2 shows patient-specific E drs Area for Patients 2, 6, 8 and 10 with PEEP. The optimal PEEP is derived using minimum E drs Area and Inflection method with the band of 5-10% above minimum E drs Area shown by the dashed-lines. E drs Area-PEEP plot. Top Left Panel: Patient 2, Top Right Panel: Patient 6. Bottom Left Panel: Patient 8, Bottom Right Panel: Patient 10. Severe COPD or patients with similar clinical features (e.g. Patient 10) showed significantly higher E drs Area compared to other patients. PEEP selection is based on minimum E drs -Area and the inflection method with PEEP increase. Figure 3 shows patient-specific constant lung elastance (E lung ) with increasing PEEP for Patients 2, 6, 8 and 10. E lung decreases with PEEP and the trend is similar to the E drs Area-PEEP plot of Figure 2, as expected from the high correlation. The optimal PEEP using minimum E lung and Inflection E lung (Dashed-lines) are also indicated. E lung -PEEP plot. Top Left Panel: Patient 2, Top Right Panel: Patient 6. Bottom Left Panel: Patient 8, Bottom Right Panel: Patient 10. PEEP derived from Minimum E lung and Inflection method are as indicated. Across all 10 patients, patient-specific constant lung elastance (E lung ) can be represented by the median of dynamic lung elastance (E drs ) with correlation R = 0.987. Correlation of E lung and WOB E is R = 0.815. E drs Area and median E drs are also closely correlated with R = 0.896. Hence, E drs can be represented with E drs Area, where E drs Area captures all E drs values in a given breath and thus, is a more physiologically representative metric. Finally, validating Equation (2), E drs Area is correlated to the work to overcome lung elastance, WOB E , as expected, with R = 0.936. The correlations are shown in Figure 4. Pearson's Correlation. Top Left Panel: E lung -Median E drs , R = 0.987. Top Right Panel: E lung -WOB E , R = 0.815. Bottom Left Panel: E drs Area-Median E drs , R = 0.896. Bottom Right Panel: E drs Area-WOB E , R = 0.936. Table 5 compares clinically selected PEEP during MV therapy with PEEP selected using Minimum E drs , and Minimum E drs Area and the Inflection method. The clinical values are set over a much narrower range, both higher and lower than those selected using E drs . Minimum E drs Area always selects a higher PEEP, by definition, than the Inflection method. However, Minimum E drs Area selects PEEP similar to or higher than Minimum E drs , where it also thus adds consideration of the reduction in overall WOB E in selecting PEEP. PEEP derived from minimum E lung and Inflection E lung are also indicated. PEEP (cmH 2 O) selection in clinical and model-based approach. Median fitting error for time-variant E drs in Table 2 is less than 1%, showing that a single compartment lung model can be used for time-varying E drs estimation. The wide range of patient-specific E drs across all patients and PEEP shown in Table 2 reflects the heterogeneity of ALI/ARDS patient condition and response to PEEP that makes standardising and PEEP selection difficult . Compared to the estimation of E lung in Table 3, median fitting error is 5.6% and in specific cases, fitting error can be as high as 15.7-17.7% (Patients 4 and 5). This latter result indicates that a first order model can be used to estimate most patient-specific constant E lung , but, in several cases, the model may not accurately represent patients' physiological condition. Time-varying E drs provides a better model fit across all patients and also provides a clearer insight into the patient's physiological condition, and is thus the better model-based metric. Figures 1 and Figure 2 shows E drs -Pressure-PEEP curves and E drs Area decrease with increasing PEEP, lung pressure, and volume over each breath. In the beginning of the recruitment manoeuvre, at zero end-expiratory pressure (ZEEP), E drs is relatively very high for all patients with median 51.9cmH 2 O/l [IQR: 30.8-63.1]. In particular, chronic obstructive pulmonary disease (COPD) patients or patients with similar clinical features  (Patients 1, 4, 5, 9 and 10) have initially the highest E drs median, as expected, from 63.1cmH 2 O/l [IQR: 57.2-81.3] versus 30.8cmH 2 O/l [IQR: 29.5-46.6] for the other patients (p = 0.0079). As PEEP rises, it is observed that E drs curves drop at patient-specific rates. High constant lung elastance, E lung at ZEEP and decreasing elastance as PEEP increments are also observed in Figure 3 for Patient 10. In all cases, patient-specific E drs and E lung decrease to a patient-specific minimum before increasing at higher PEEP. Minimum E drs and E lung suggest the point where the lung is most compliant, if ventilated at that PEEP level. Further increases in PEEP and pressure thus lead to increased E lung or E drs , and thus increase detrimental effects. In particular, increases in E lung or E drs can be associated with overstretching of the patient's lung [16, 28]. However, the heterogeneity of ALI/ARDS means there is a possibility of overstretching of healthy lung units even at low PEEP and airway pressures . Thus, Minimum or, perhaps preferably, Inflection E drs and E lung can provide a potentially higher resolution metric. Patients 2 and 6 (Figure 1, 2, 3: Top panels) are examples where patient-specific E drs , E drs Area and E lung increase after descending to a minimum. Results suggest that further increases of PEEP and inflation pressures will stretch lung units causing possible damage, as seen by increasing E drs at higher PEEP. The rise of E drs occurs at relatively low PEEP and pressure 15-20cmH 2 O in these two patients. In contrast, Patients 8 and 10 (Figure 1, 2, 3: Bottom panels) never see E drs or E lung rising even at the maximum PEEP used in this study. However, the E drs range at higher PEEP for Patients 8 and 10 (PEEP 15~30cmH 2 O) is relatively small with median E drs = 31.3cmH 2 O/l, [IQR = 27.2-33.9]. This outcome indicates that further increases of PEEP from 15 to 30cmH 2 O has no added advantage in reducing E drs , suggesting PEEP selection should be made at using the Inflection method. Table 2 shows median [IQR] E drs for every patient and PEEP. The IQR range drops significantly for every patient as PEEP increases. This range also indicates lung status or condition with the influence of pressure. A small IQR range indicates that the lung is ventilated at a PEEP level where maximal lung recruitment occurs over a narrow pressure range as tidal volume, V t is fixed in the MV mode used. A high IQR range shows the opposite. Hence, the lengths along pressure in Figure 1 also indicate how readily the patient was recruited and that easiest recruitment occurs at minimum E drs . Table 4 shows the patient-specific E drs Area at each PEEP. It is found that E drs Area is closely related to median E drs , as shown in Figure 4. E drs Area at lower PEEP with median 64.9 cmH2Os/l [IQR: 37.6-102.2] is observed and as PEEP increases, E drs Area decreases. Upon reaching minimum E drs Area, patient-specific E drs Area increase with PEEP (Patients 2, 4, 6, 7 and 10). This trend is similar to the trend observed in patient-specific dynamic E drs (Table 2) and constant E lung (Table 3). Optimal PEEP derived using minimum or inflection method in E drs Area is similar to minimum patient-specific E drs but different as E drs Area considers the whole inspiration and the effect of WOB E . It is also found that E drs Area is closely correlated to work in overcoming the lung elastic properties (WOB E ). This means that E drs Area provides combined information of patients-specific lung physiological conditions as well as work of breathing. Table 5 shows the model-based approaches to PEEP selection compared to clinically selected PEEP. For 9 of 10 patients, the PEEP value selected using Minimum E drs and E drs Area results in a value higher than the clinically selected PEEP. This latter result suggests that these patients could be treated at PEEP levels higher than clinically selected PEEP. When Minimum E drs or E drs Area metrics are compared with Minimum E lung , they result in selecting similar PEEP. However, selecting PEEP is a trade off in minimizing lung pressure and potential damage, versus maximizing recruitment. Hence, the Inflection method offers similar recruitment at a lower PEEP and may be a safer choice, although its selected values are still higher than clinically selected in 7 of 10 cases. Overall, these results reflect the heterogeneity of the ALI/ARDS lung and the need for patient-specific approaches to select PEEP. Patient 9 is an interesting case which illustrates the model's potential to capture unique patient-specific lung recruitment and condition as it occurs in a clinically and physiologically relevant manner. When the patient is ventilated from PEEP of 5 to 10cmH 2 O, median E drs only decreases by less than 1.0cmH 2 O/l. However, when PEEP is increased to 15cmH 2 O, the median E drs drops significantly, as shown in Figure 5. This smaller E drs drop suggests that only minimal lung volume is recruited from PEEP of 5 to 10 cmH 2 O. The significant drop in E drs at PEEP 15cmH 2 O indicates that PEEP 15 cmH 2 O has overcome recruitment resistance and additional new lung volume is recruited. Patient 9 was diagnosed with H1N1 and high PEEP for lung recruitment has proven to be beneficial for these patients . Similar trends can be observed in Figure 5 bottom panels with the E drs Area-PEEP plot and E lung -PEEP-plot. Patient 9 E drs , E drs Area and E lung change with PEEP. Top Panel: Box-and-whisker diagram for Patient 9 E drs when PEEP increase from 5 to 10cmH 2 O. The E drs drops significantly when PEEP is increase from 10 to 15cmH 2 O. Bottom Left Panel: E drs Area-PEEP plot for Patient 9. Bottom Right Panel: E lung -PEEP for Patient 9. In this research, the lung model used to identify patient-specific E drs comprised a single compartment lung model. It was initially proposed for simple computational analysis and neglects the effect of nonlinear flow . However, this analysis is based predominantly on trend comparisons, where the patient is their own reference. In addition, the model is simple and capable of capturing the fundamental lung mechanics, which varies intra- and inter- patients. Hence, this limitation should be minimal in this case, but should be confirmed with direct prospective clinical studies. During the clinical trials, the patients were sedated and paralyzed using muscle relaxants. It is assumed that after sedation, the patient will be fully dependant on mechanical ventilation and not have spontaneous breathing effort. This assumption thus assumes the patient's pleural pressure (P pl ) after sedation is zero and allows P pl in Equation (3) to be omitted, which may not be entirely valid . However, this assumption is made for the first step study to prove the concept within a simpler situation. Otherwise, the terms E lung and E drs would represent a respiratory system elastance  and time-variant dynamic respiratory system elastance. However, given the low fitting errors observed, this issue should have little impact in this research. During the course of estimating patient-specific E lung or E drs , respiratory system resistance, R, is assumed overall constant within a physiological range  as PEEP increases. This assumption may not be entirely valid in some cases [33, 34]. However, continuous measurements of respiratory resistance are not typically available and the effect of this resistive term is limited mathematically in its impact. Equally, trend comparison, as used here, across PEEP values will reduce the impact. The identification of E lung , E drs and E drs Area during MV is presented as a method to select PEEP, but there is currently no conclusive, optimum overall E drs or E drs Area in patients. E drs range varies depending on patient disease state and thus will also change over time. However, this trial includes only 10 patients, and there is not yet enough clinical data to indicate an optimum E lung , E drs or E drs Area value for a specific patient or group. On-going, prospective trials with more specific patient groups should develop more conclusive outcomes, relating specific set values of E drs metrics to effective patient-specific treatments and clinical outcome. In particular, the time-varying E drs value and its change over a given breathing cycle, provides additional insight to guide ventilation that is not investigated here. For example, changes in ventilator pattern or mode to modify the E drs trajectory could also be used with this data to guide therapy choice. However, this study does not have the numbers or design to provide that advice, or specific E drs values associated with specific decrease state or lung damage. The model-based approach presented provides patient-specific, physiological insight not directly measurable without additional invasive, disruptive and clinically intensive test manoeuvres. This method can be directly implemented using modern ventilators with minimal, limited PEEP titrations, and thus without significant interruption to ongoing therapy. In particular, the full manoeuvres used here would not be required for clinical use, and only modest PEEP changes (3-8cmH 2 O) would be required to determine if E drs was decreasing at a different PEEP. 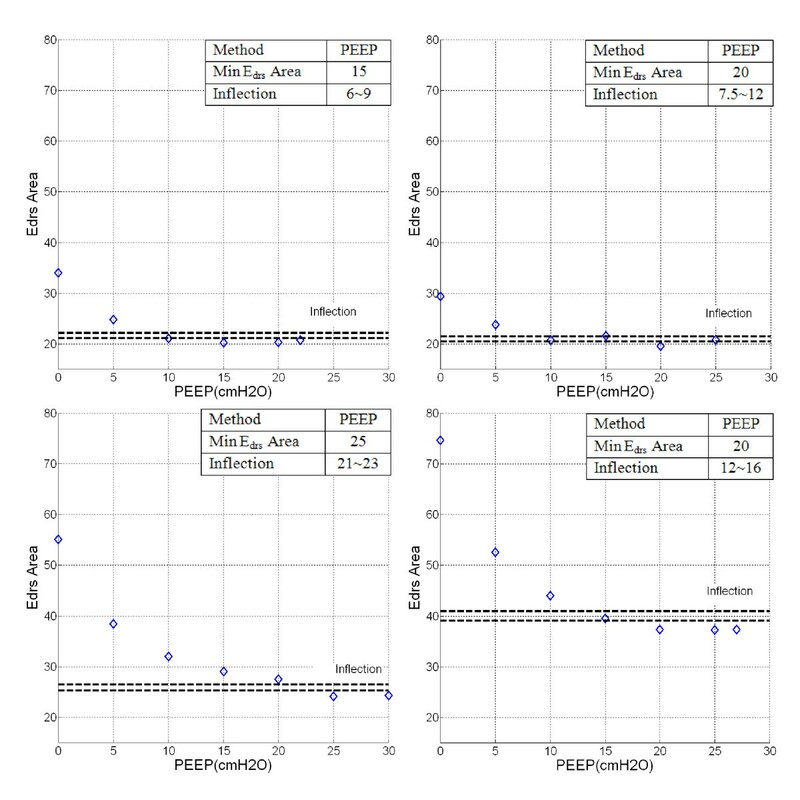 E drs offers higher resolution in patients' response to change of pressure and PEEP, which is potentially, a better metric compared to existing constant lung elastance estimation. Thus, the overall method is readily generalisable and clinical practicable. It is able to capture patient-specific condition and responsiveness to PEEP and recruitment accurately, and as clinically expected. Hence, the approach presented offers significant potential to improve clinical insight and delivery of mechanical ventilation, and should be prospectively tested. YSC, JGC, GMS created and defined the model. YSC, JGC and TD had input to analysis of results. GMS, AS implemented trials clinically with input from all others. All authors had input in writing and revising the manuscript. All authors have read and approved the final manuscript. Written informed consent was obtained from the participant and or relative/friends/family of this study. A copy of written consent is available for review by the Editor-in-Chief of this journal.